Shapla Neer is a non-governmental organization established in 1972 that provides emergency relief and social services to underprivileged communities in South Asian countries. Support services in Bangladesh, Nepal, and Japan include community development, support for underprivileged children, and disaster preparedness and response. Direct Relief has supported Shapla Neer since April 2011 with cash grants to fund earthquake, tsunami, and nuclear disaster relief and recovery efforts. Shapla Neer began its relief activities shortly after the earthquake and tsunami struck Japan in March 2011. Funding from Direct Relief was used by Shapla Neer to support activities in Fukushima Prefecture on the border of the nuclear evacuation zone, where the threat of radiation contamination led to delays in providing supplies and assistance, isolating citizens. Shapla Neer focused services on people living in temporary housing and those living in or near the evacuation area with poor access to services. Shapla Neer’s emergency work has focused on needs in Fukushima Prefecture, where about 100,000 people were displaced as a result of the earthquake, tsunami, and nuclear disasters. Shapla Neer has worked with the local government in Iwaki City to assess and fulfill the needs of disaster victims living in and around the 20-kilometer exclusion zone around the Fukushima Daiichi nuclear power plant. Shapla Neer has also participated in forums designed to aggregate and share information among governments and nonprofits in the area, creating connections and avoiding duplication of efforts. 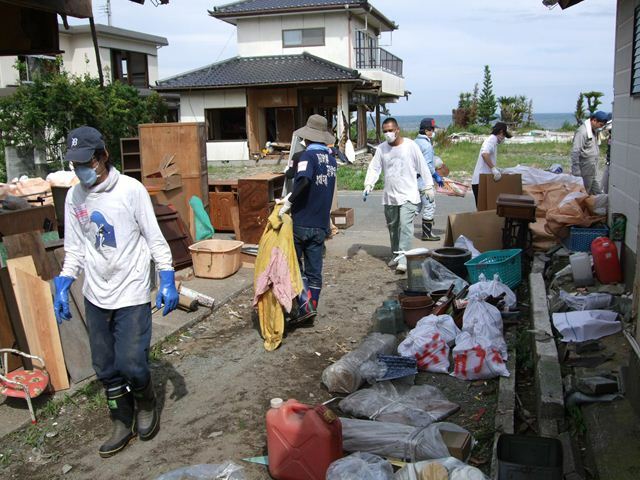 Establishment of Disaster Volunteer Centers: In April 2011, Shapla Neer established volunteer centers in Nokoso and Onahama, both operating in collaboration with local government entities. Volunteers have been carrying out a variety of activities, including cleaning houses and drainage trenches, distributing of supplies, and surveying needs. School Bus Service: Over 200 students from two schools in Iwaki City utilized Shapla Neer’s shuttle services to attend activities and classes in temporary classrooms made available by neighboring schools. Without this service in summer months, students would not have been able to travel to the schools. This service allowed parents to work and prevented children from dropping out of school. Needs Assessment: Shapla Neer assessed the needs of underserved populations and people living in temporary shelters. Needs included a variety of goods and services—from blankets to assistance grocery shopping. A total of 950 families were included on needs assessment surveys.